It's super easy to make too. Place a medium or large pot over medium-high heat and add enough kernels to cover the bottom. Top with a lid and then sort of shake the pot every few seconds Start shaking the pot and keep shaking, this is the essential part about making popcorn over a open flame/heat source. It’ll take about 2 minutes to get the popcorn popping so work those arms out. . If you're using a saucepan with a lid—and your arm is up for it—let it hover right above your burner and move the pan in a circular motion to prevent the kernels from burning. . After just a few minutes once you hear the popping stop, quickly remove it from the heat source and dump the contents into a large bowl. you'll have perfectly popped corn. This method also allows you to cook the popcorn without any butter or oil, so it is much healthier. There’s a lot of ways to add flavor to your popcorn.Now come to Homemade Caramel Popcorn. Caramel corn a confection loved by kids. 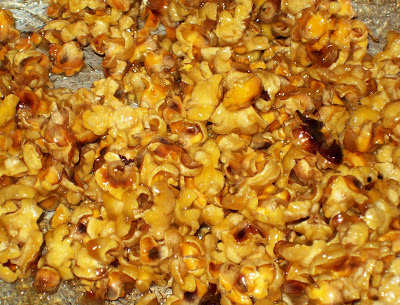 It is cooked popcorn smothered with caramel or molasses. Popcorn and caramel is a combination of sweetness and crunchiness that create delightful crackles when eaten. To create lighter caramel corn with more buttery flavor, the white sugar-based caramel is used, instead of the brown sugar versions. Caramel corn can also contain peanuts or almonds. This carmel popcorn recipe is sugar free and very easy. Homemade caramel corn is an inexpensive and delicious snack. In a saucepan, mix brown sugar, margarine, corn syrup& salt. Bring the mixture to a boil and boil for 3-5 minutes. Remove from heat and stir in vanilla and soda. which will cause the mixture to bubble up. Mix well. Immediately pour syrup over the popped corn and stir until evenly coated. if you want more, make multiple batches. Remove from the heat and let cool completely before storing. An home made fresh caramel popcorn is a cool idea. 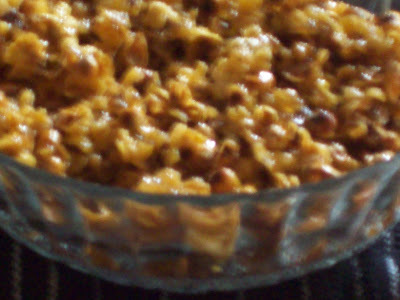 Hi Jayashree, I love caramel popcorn though I have never prepared it at home. Yours looks simply delicious. looks so delish......I love caramel popcorn we used to eat in school. Thank you all for lovely comments. me too like caramel popcorn like a kid :)..
Dear Jai, Thanks for the add in orkut! I like ur unique name! I like ur easy to fix recipes! You explain them well! Keep them coming! 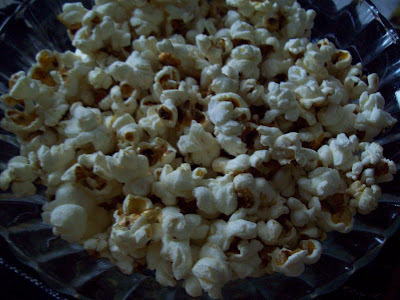 have never tried making popcorn at home...its a nice idea to make at home! !